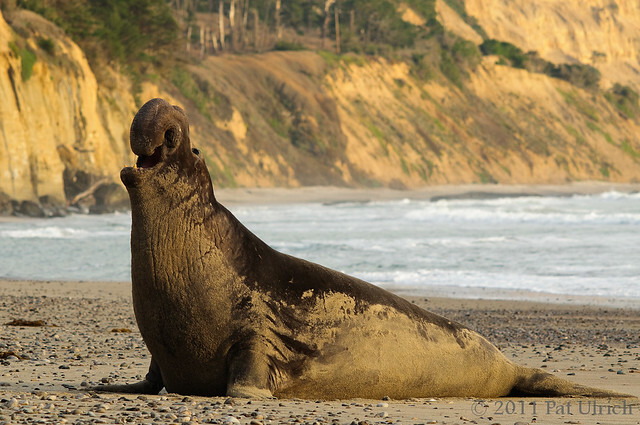 Last weekend was our annual trip to Año Nuevo State Reserve to see the northern elephant seals. We had a terrific trip, and I came home with some images that I'm pretty excited about. 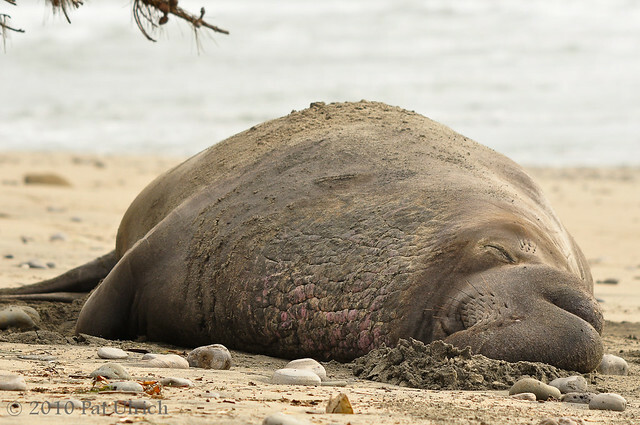 Thus, there will likely be a lot of big marine mammals on the blog this week. I'm just so fascinated by these awesome creatures! Here are two shots to get things started while I work my way through the pile. This is a bull on Loser's Beach making his presence known around sunset. I like the first image slightly more since the eye is a bit more visible, but the second one shows him stretched a bit taller with the nose a tad more prominent (I know, pretty subtle differences). This guy was no where near the largest of the bulls we saw, but he was the most photogenic. And since making-of images are always fun, here's a shot taken by my wife of me behind the lens photographing this male. The rule at the reserve is to stay at least 25 feet away from the seals at all times, but I'm not sure that I would ever want to get that close! 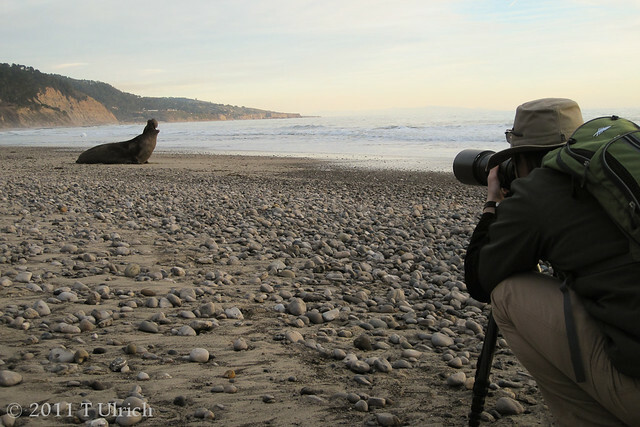 One more shot from the archives of my 2010 trip to Año Nuevo State Reserve. 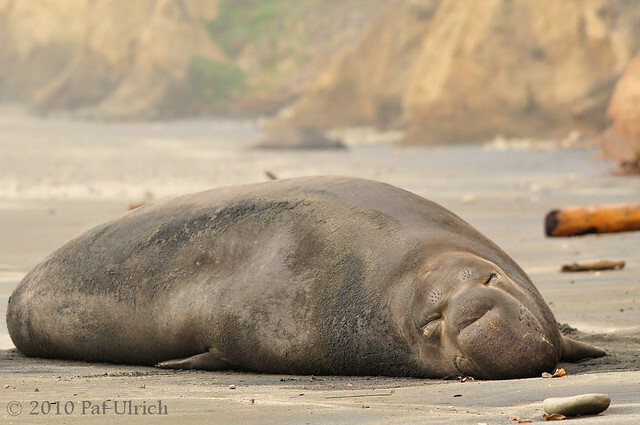 This is another male northern elephant seal resting on Loser's Beach in the reserve. You can see an additional male in the backdrop of this image, its the brownish blob near the cliff base. 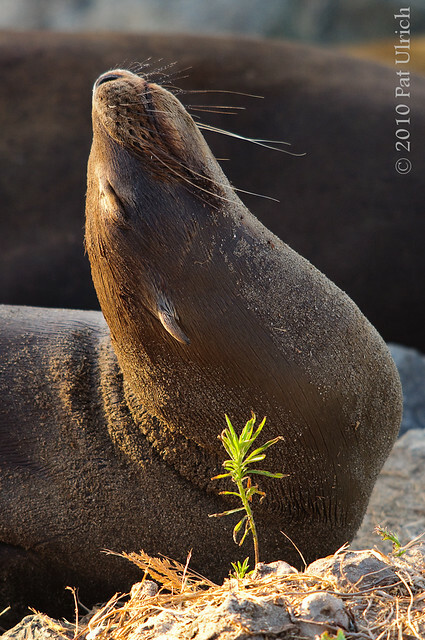 In February I posted a portrait of this particular seal, which is one of my favorite shots of these guys. As I mentioned at the time, they are often regarded as loud, aggressive beasts (which they can be at times), but I like to show off their more relaxed side, since they spend a lot of their time resting. 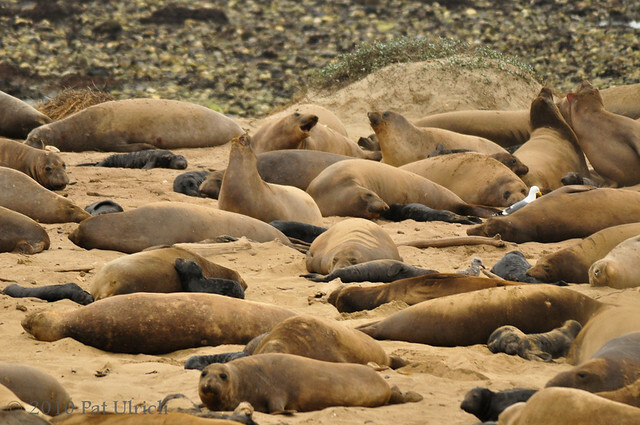 The density of elephant seals in the breeding colony at Año Nuevo State Reserve is pretty interesting. Here you can see a group of mothers with their pups (the cute little black ones) together on the beach. They more or less stay about one biting-distance away from each other, and we saw a few arguments break out between females that got too close to another one's pup. Likely there would be one beachmaster bull that has control of this harem, although other bulls will stay around the edges to take advantage of an opportunity, should it arise. 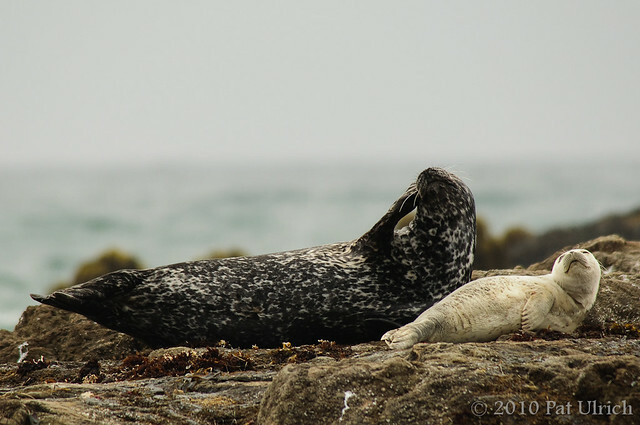 This likely also accounts for when the seals stay so close, since the male will herd the females together into his territory on the beach. The pups are awfully cute when they are born, and soon enough they'll be over 300 pounds! I wrote a short post about their amazing first few months with some close-up shots of the pups in a previous post, if you are interested. Happy 2011, everyone! I hope you had a wonderful holiday season. I had a great trip to visit with my family, but it never seems to last long enough. 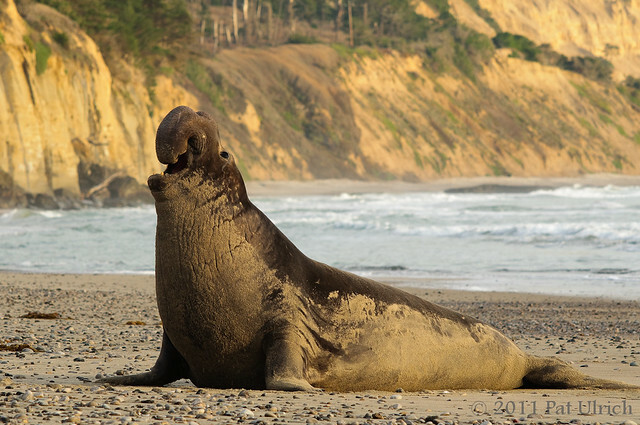 One redeeming thing about the end of the holiday season though, is that I'm due for my annual pilgrimage to Año Nuevo State Reserve to see the elephant seals. Since I hope to get down there soon, I've flipped through my trip from last year and found a few shots that I never posted. This shot is of a fairly large bull relaxing on Loser's Beach (where the non-dominant bulls go to rest away from the crowd). 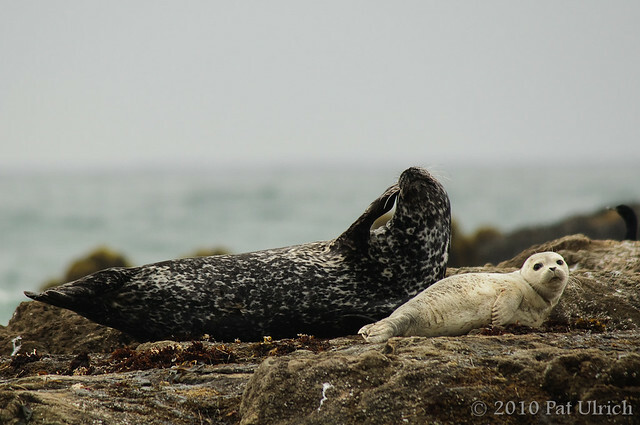 A highlight of our August trip to MacKerricher State Park on the Mendocino coast was the harbor seals that hauled out on the rocks that were just offshore. 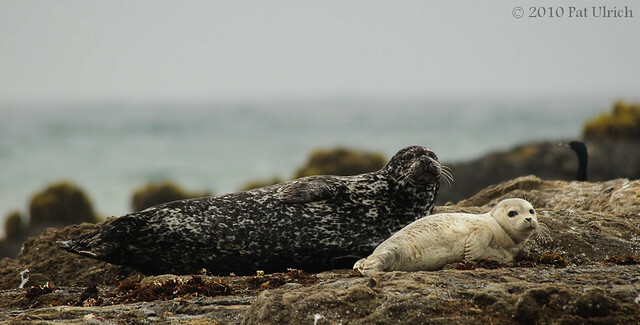 This provided a great opportunity to observe them at relatively close range, and since there was water between the beach and their rocks, they were at ease when a group of onlookers stopped by. We saw a handful of young pups in the group, some of which were playing in the water, and some like this one were hauled out on the rocks. Based on the struggles we saw of other pups trying to get out of the water, I'm not quite sure how this little guy made it all the way to the top. But kudos to him, and perhaps some encouraging pushes from his mother were in order. 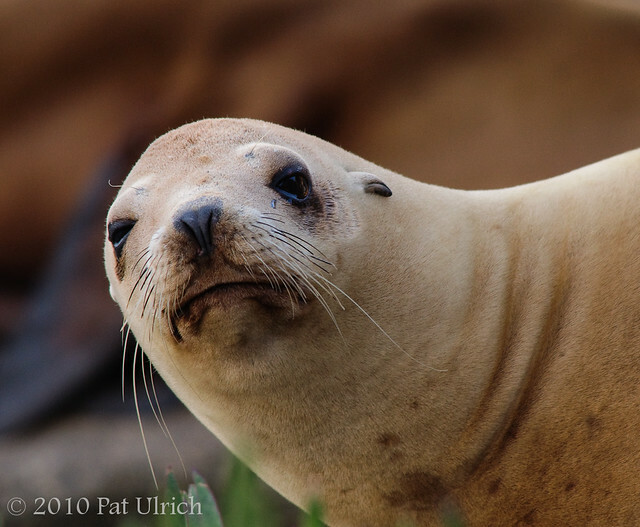 I found the diversity of coloration and patterns on the seals to be quite interesting, and my personal favorite were those with the really dark colors like this mother. Perhaps her cute pup will one day grow up to look just like her! 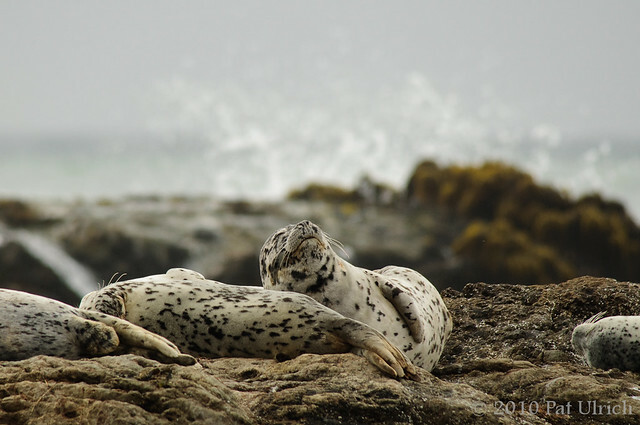 Harbor seals resting on offshore rocks, well away from the crashing waves behind them. Taken at MacKerricher State Park, near Fort Bragg, CA. My wife and I always enjoy a quick weekend trip to Monterey when we get a chance, and we were down that way over the July 4th weekend. 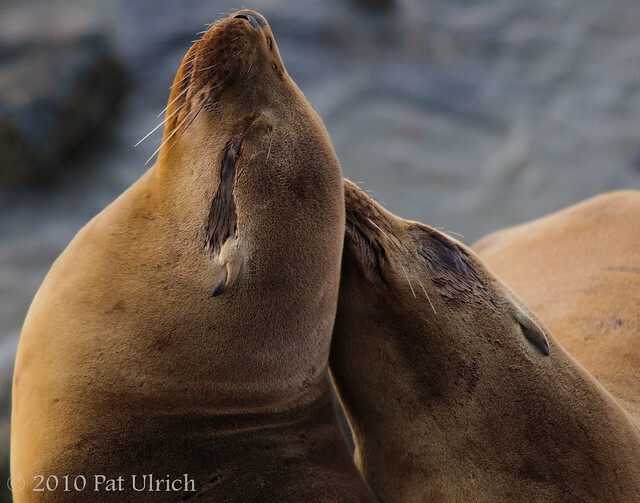 While I was unfortunately fogged out of doing photography at Moss Landing State Beach as I had hoped, we had an unexpected surprise with a sizeable group of California sea lions drawing crowds at the Old Fisherman's Wharf. When we walked by on our way to dinner the sea lions were as noisy as they usually are, barking loudly and generally making a ruckus. But after we had our meal and were heading out, the last of the light was drifting below the trees and the sea lions were much more subdued. It seemed to be mostly younger animals in the group, with only one large male along the shore, and this youngster appeared to be enjoying quiet warmth of the last rays of sunshine before they slipped below the horizon.